Addresses by S.N. 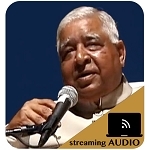 Goenka and four others from the second "Insights from an Ancient Tradition" conference, held at the Vipassana Meditation Center (Dhamma Dhara) in Shelburne Falls, Massachusetts, USA, September 3 - 4, 2000. 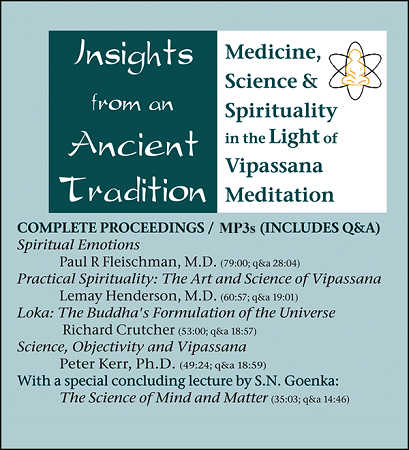 The MP3s include questions and answers at the end of each talk. The conference followed a ten-day Vipassana retreat. 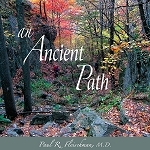 It was designed so that participants could explore at the intellectual level what they had experienced while meditating. 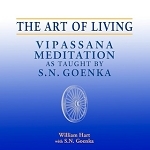 The four presenters at the conference were all Vipassana meditators who live engaged professional lives and who serve as assistants or teachers of Vipassana, appointed by Mr. Goenka. The revered Teacher of Vipassana, who was visiting America for the first time in nine years, had just completed his participation in the Millenium Peace Summit at the United Nations.